How many of you lately have been trying to cut the carbs? I’ve been trying to do vegan keto, but it’s really hard to do that without resorting to processed protein-rich food sources. For those of you who don’t know what the heck “keto” is, it means to limit your carbs, and also limit your protein (just not as much as carbs). The aim is to consume no more than 20-50 grams of carbs in a day. Doing this causes levels of insulin to go down releasing fatty acids from the body’s fat stores in large amounts. This puts your body into “ketosis”, which means that your body produces ketones by oxidizing these fatty acids from the diet, which provide energy for the body. Unlike fatty acids, ketones can cross the blood-brain barrier and provide energy for the brain in the absence of glucose, giving you lazer-like focus. Now, for my weight, it’s recommended by general nutritionists that I have at least 65 grams of protein per day, and I’m not talking keto here. It’s already hard for me to hit that as a vegan without resorting to eating tofu or Beyond Burgers for every meal which I just don’t want to do. So, how did I flesh this all out? The answer is that I’m still trying to figure it out. One thing that bugs me about these kinds of diets, is that they’re saying that they’re limiting one specific thing. They have “no sugar” diets, but even vegetables have some grams of sugar. Fruits have wildly varying sugar contents too, so where do we draw the line? My logical brain needs to know! If we are on a carb cutting diet, must I limit my onion intake, or can I just limit things like rice, beans, and flour? A quarter cup of onion has almost 4 grams of carbs! When it comes to this, I’ll generally opt for whole foods then, and yes, perhaps limit my onions and up my tofu intake, but only until I get to my ideal goal weight. 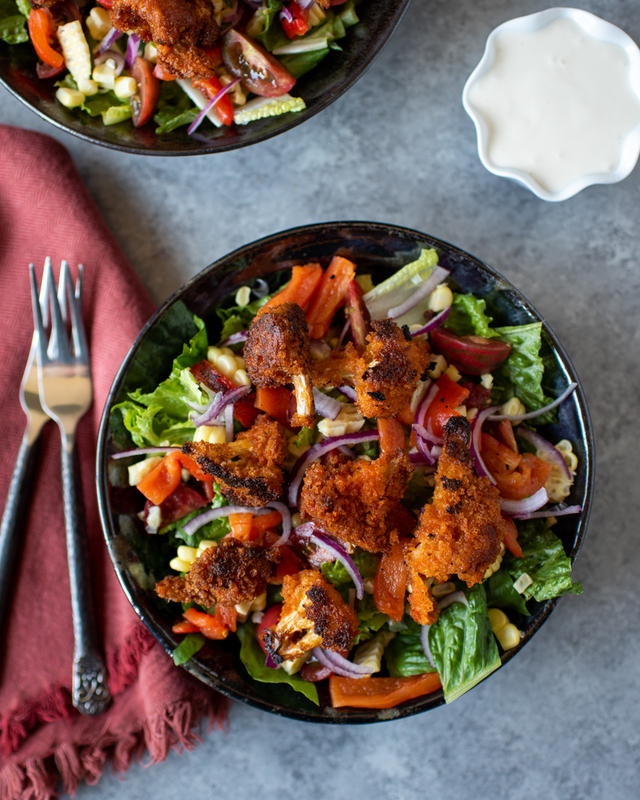 In the midst of all this keto business, and after the delicious Cauliflower Buffalo Wings last week, I had the brilliant idea for this salad, which gives us the best of both worlds. Get the greens in, to hell with the corn and onions ( = carbs), and only have 7 pieces of Cauliflower Buffalo Wings instead of 20 (which would definitely kick me out of my pseudo-ketosis). Melissa’s Produce jarred Roasted Red Peppers makes a nice smoky addition. So, the moral here is moderation. 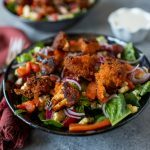 I can have the small amount of flour and panko bread crumbs on my cauliflower, along with the corn and onions, lots of greens, and fatty vegan blue cheese dressing in this Buffalo Cauliflower Salad. The end! I hope you enjoy this recipe! As always, tag #thedevilwearsparsley on Instagram, and show me your creations! 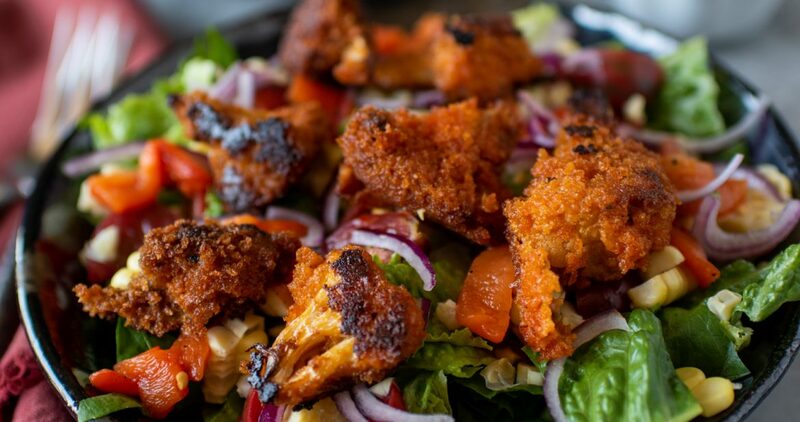 Moderation and indulgence collide with this spicy, crunchy, and nutritious salad! Preheat oven to 400°F. Arrange left-over Cauliflower Buffalo Wings on a sheet pan. 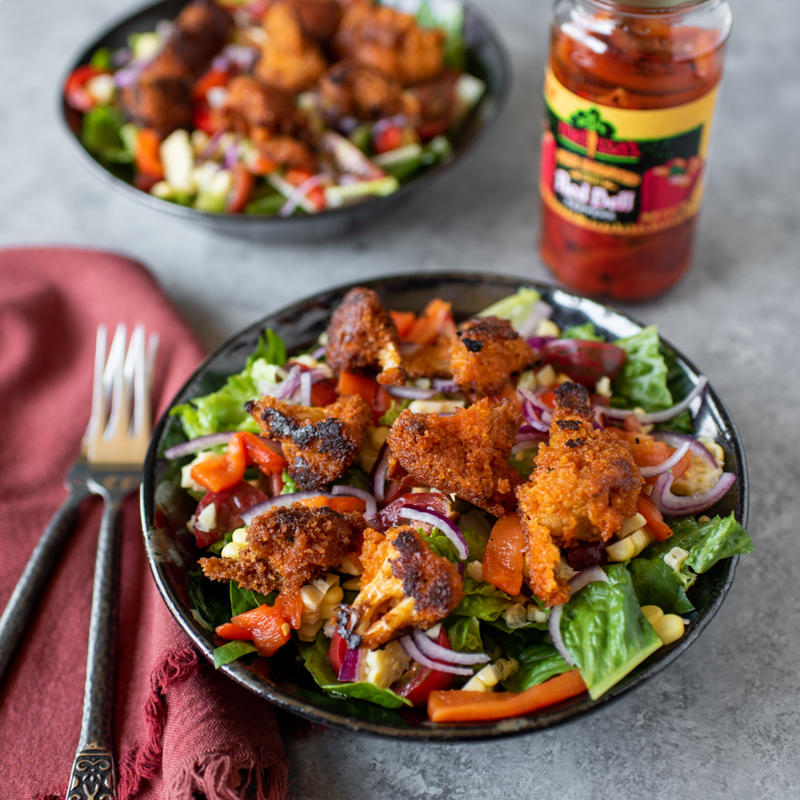 While the oven heats, prepare the salads, splitting the lettuce, corn, roasted red pepper, red onion, and grape tomatoes between two large bowls. When the oven reaches 400°F, insert the pan of cauliflower. Wait 10 minutes until crispy. Remove from oven, and top the salads with the cauliflower. Drizzle with vegan blue cheese, and enjoy! I use Melissa's Produce Roasted Red Peppers to save time, and Daiya Blue Cheeze for the blue cheese dressing. I love that you put these in a salad! I’m always trying to eat healthier and this is definitely one of those dishes where you are 100% satisfied while doing so. YUM!